I often coach people on issues of conflict at work and in doing so refer to the Thomas-Kilman1 conflict model which suggests that our approach to conflict is driven by two elements; the importance of the outcome to us and the importance of the relationship. A focus on the outcome rather than the relationship can lead to an ‘I win – you lose’ approach, where as a focus on the relationship and not the outcome can lead to a ‘you win – I lose’ approach. Ideally we are trying to get to a win-win approach. This not only takes time, as much time as is needed, it also requires us to be able to listen empathetically (as Covey describes it)2. This means putting ourselves in the other persons shoes and really wanting to understand where the other person is coming from. Edgar Schien3 elaborates on this, telling us to ‘leave our ego at the door’ and approach discussions with a genuine desire to understand the other persons point of view. Understanding someone else’s viewpoint is not the same as agreeing with it, we are trying to get a connection through understanding, not demand agreement. We can only reach this understanding by asking great questions and employing empathetic listening. Sadly todays politicians are often portrayed in the media and on screenings of parliamentary sessions as adopting one approach, ‘I win, you lose’. This approach leads to childish [cheap] jibes at the opposition which evoke reactive responses. If you really want to study this then acquaint yourself with Eric Berne’s4 theory of transactional analysis5 and see how many ‘child to child’ or ‘parent to child’ reactions you can spot on BBC Parliament. What is harder to spot is any adult to adult interactions (usually these only appear when there are tragedies such as the London, or Manchester, Terrorist attacks). If these are the behaviours our Leaders display then is it any wonder that our emerging talent in organisations see ‘winning’ as the desired result and fear losing. Hence conflict arises as both parties enter their respective corners as they put forward their opinions and feel the urge to vigorously defend their declared opinion to ensure they ‘win’. Hence they ‘come out fighting’ determined to prove they are right. So how can we break out of this unproductive conflict? Well one lesson may come oddly from the UK court system. Barristers are seen to argue their case effectively in court against their opposite number, sometimes with passion and with gusto, yet in between the court sessions both barristers can be seen having lunch or coffee together. They separate the problem from person. In Getting to Yes, Fisher, Ury and Paton7 term this as being hard on the problem and soft on the person. In other words, we can agree to disagree with another person’s opinion without resorting to personal attacks, that is, we respect the other person’s right to hold their own opinion. Sadly social media seems to encourage the opposite of this. The absence of direct eyeball to eyeball contact seems to lead to outlandish, personal and vicious insults being meted out at someone whose only crime is to offer a different point of view of the other person. As our aspiring leaders of tomorrow are our social media users of today, I believe this needs to be addressed not just in the home, but in schools, in social activities and as people enter employment. We need to develop critical thinking, curiosity, debating skills, conflict management, compassion and emotional intelligence in children that will carry them confidently into adulthood. These life-skills will enable them to discern from the array of information thrown at them and make sense of the world in ways that is accepting of difference, rather than striving to always hold the same view as others, or to be proved ‘right’. One reason why organisations should be addressing this as a matter of high priority is that leaders are role models, whether they are leading teams, projects, organisations or countries. How employees interact with others is a response to the behaviours seen from those in leadership roles, as they interpret the culture and ‘accepted way to act’ within the organisation from these leaders. Jonathan Haidt8 suggests we make decisions first by an intuitive response based on our values, we then look for the facts to support our opinion. This theory highlights a key issue. If someone disagrees with our viewpoint, and our views come from our values, then our natural response is to feel that their view represents a personal attack on our own values and hence, if we do not exercise emotional control, we ‘come out on the defence’. This usually takes the form of a counter attack. If we can dampen this entirely human, but not always helpful, response then we can focus on seeking to understand why the other person holds the view they do. Asking great questions to uncover their thinking and underlying beliefs may not convince us their idea is one we should adapt to, but it may help us arrive at a ‘truce’ whereby we respect their right to hold their opinion. Also by exchanging views with each other, in a non-threatening or judgemental way, we create the space for true exploration of different views. This enables the introduction of new facts to our knowledge and perhaps make it safe for us to change our opinion (or for the other person to change theirs) without evoking feelings of having ‘lost’, given ground, or being somehow inferior for having altered our view. This willingness to learn, get feedback on ideas and adapt creates a curious and exciting environment development. It is supported in theories by Carol Dweck9 on the Growth versus the Fixed Mindset. Getting joy from learning, exploring and yes, at times, even from failing (as by failing you have learnt what doesn’t work), is something we should encourage. As leaders it is important to role model this too, after all who wants to work for someone who is always right and who knocks down challenge without acknowledging the potential that the challenge may be legitimate? So if we want to encourage people to share ideas, to explore all options, to feel safe to share even half-formed ideas, then as leaders we need to create the culture and environment that allows different views to co-exist. This means actively striving to remove the ‘nastiness’ and personal attacks from debates in the workplace and instead move towards a culture of ‘namaste’. By ‘Namaste’10, I mean that we look for the good in others and respect that if people are expressing their values, whether we agree or disagree with them, their belief is important to them and we need to be respectful of that. Creating a ‘Namaste’ culture begins with ourselves as leaders role modelling how to engage in discussions with others. This begins by asking ourselves, how willing we are to show vulnerability? How often do we actively engage in humble inquiry with a genuine desire to understand others? 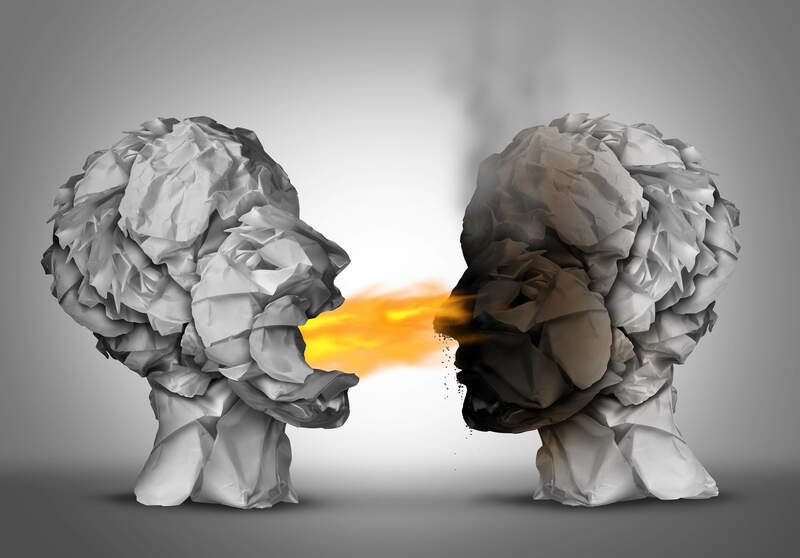 How often do we encourage healthy debate from a variety of diverse viewpoints, even (and especially) when, we have a solution in mind which we are strongly attached to? I would suggest that if we are to lead with integrity and lead effectively, we need to create spaces where ideas are exchanged in a mindset that is less ‘nasty’ and more ‘Namaste’. In short we each have 3 ego states, ‘Parent’, ‘Adult’ and ‘Child’, these can be helpful or can hinder us. For example, whilst a nurturing parent helps us feel safe to develop and try new things, a critical parent can destroy our confidence. The ego state deployed by another person can trigger response states in us, e.g. If I behave childishly, you may feel compelled to ‘tell me off’. Being aware of our states and then controlling them are crucial for effective interactions with others. In the work environment we are seeing to largely enact ‘adult to adult’ interactions. When other states in their negative form are deployed then conflict arises.